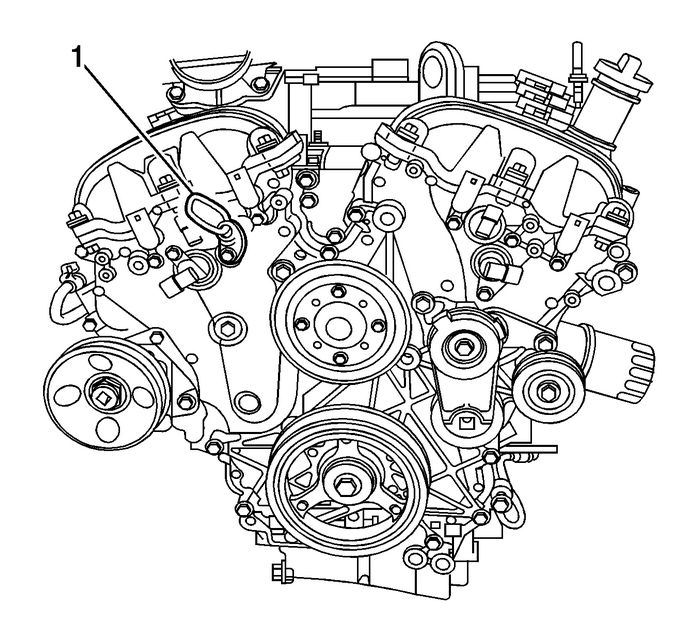 Remove the intake manifold cover. 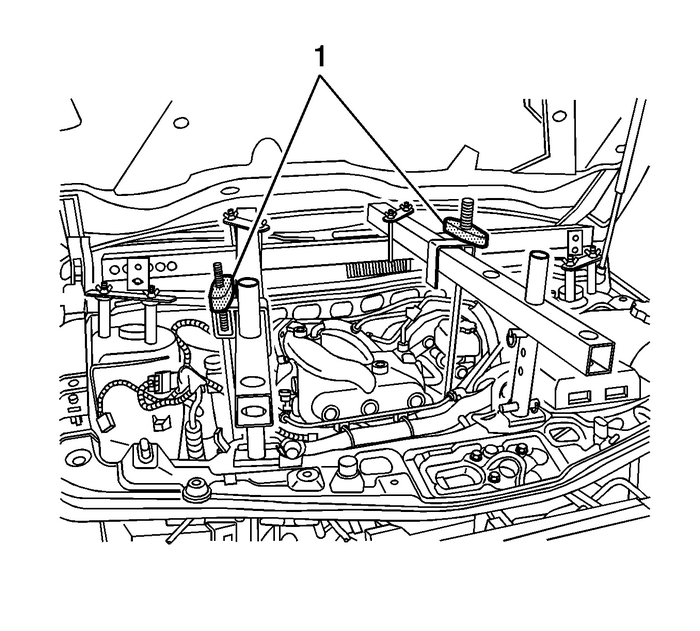 Refer toIntake Manifold Cover Replacement.Remove the Front Bumper Fascia Support. 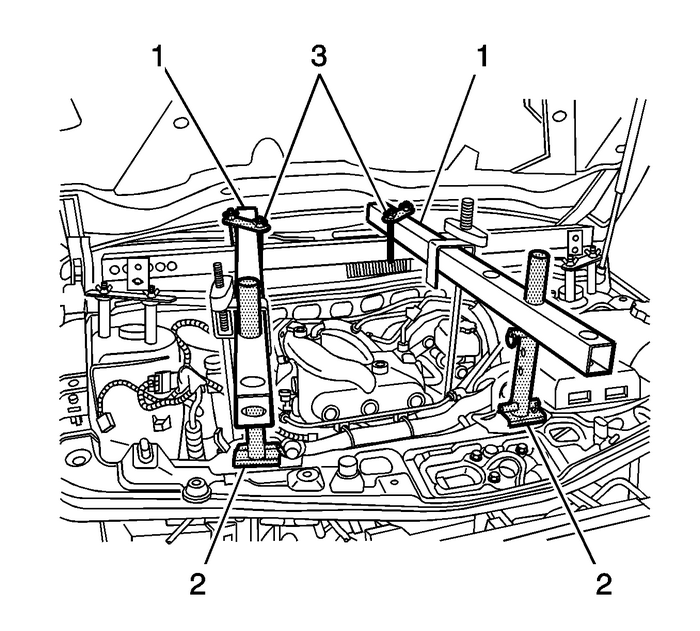 Refer toFront Bumper Fascia Support ReplacementRemove the air inlet screen. Refer toAir Inlet Screen ReplacementInstall two M8 x 1.25 double ended studs to each strut tower with 30 mm engagementto the strut tower and 16 mm engagement to the J-28467-13 engine support fixture adapters.Install three J-28467-13 engine support fixture adapters-(1) and two J-28467-5 strut tower adapters-(2) to the top of the left and right struttower.Install a 127-cm (50-in) engine support fixture cross bar J 28467-B universal engine support fixture-(3) transversely across the vehicle between both J-28467-5 strut tower adapters-(2).Insert safety pins J-28467-10-(4) through the J-28467-5 strut tower adapters-(2) andthe cross bar-(3) to prevent movement. 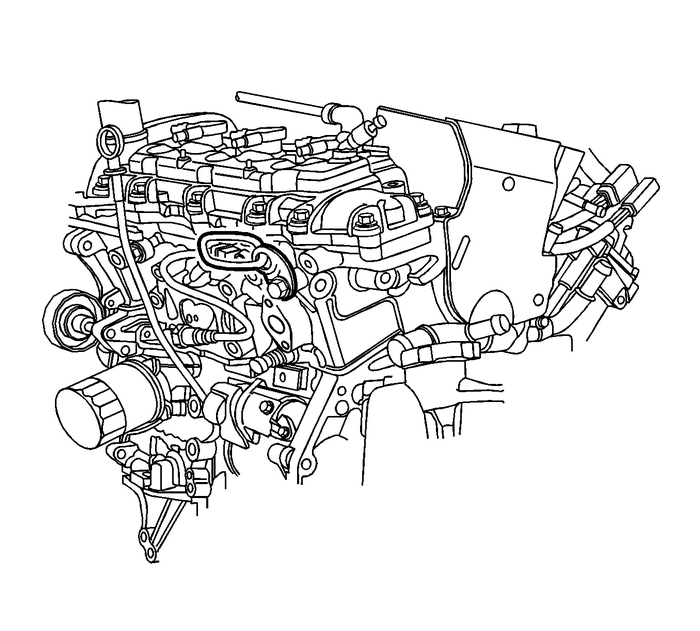 Install the engine support bracket J 42451-1 engine support adapter to the engine. Position two 58-cm (23-in) engine support fixture cross bars-(1) longitudinally withtwo J 36462-A engine support adapter leg set leg assembly-(2).Install two J-28467-1A- clamp-(3) to secure the longitudinal mounted cross bar tothe transverse mounted cross bar. 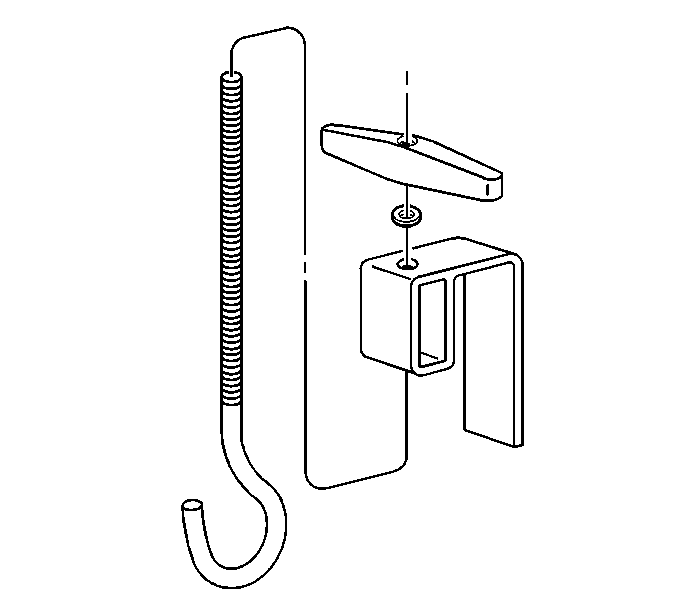 Assemble the lift hook wing nut J 28467-34 lift hook wing nut and washer and the lift hook bracket J-28467-6A to the lift hook J 28467-7A bolt hook. 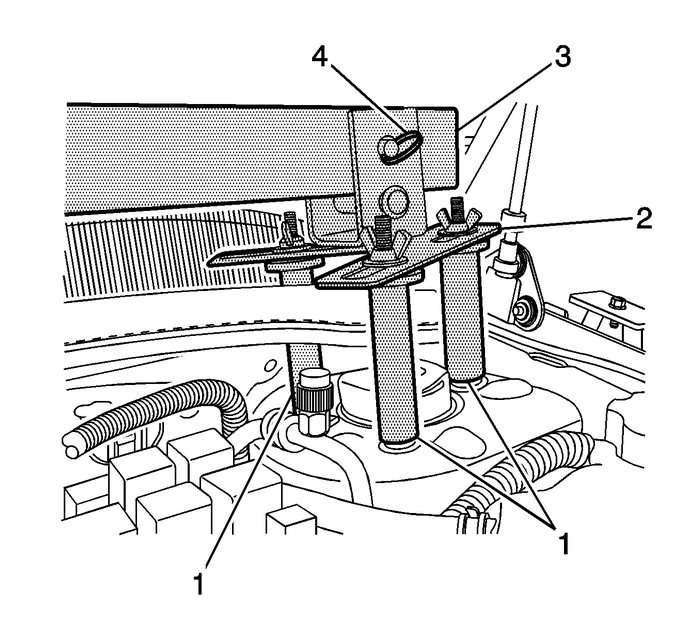 Install the lift hook and bracket assembly-(1) to the longitudinal mounted cross bar-(2). Position the J 28467-7A bolt hook lift hook to the rear engine lift bracket J 42451-1 engine support adapter-(2). Position the J 28467-7A bolt hook-(1) to the front engine lift bracket J 42451-1 engine support adapter-(2). 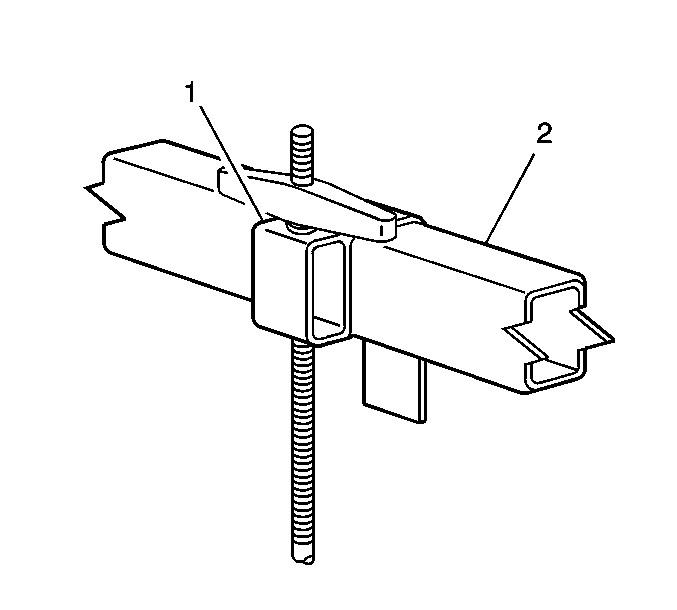 Evenly tighten both wing nuts J 28467-34 lift hook wing nut and washer-(1) until the engine weight is supported by the engine support fixture and no longercarried by the engine mounts.